If you just looked at the web sites of the two Four Season’s resorts on the island of Lanai, The Four Season’s at Manele Bay looks more like the typical Hawaiian resort—near the ocean with beach access, stunning views, seaside palms swaying the breeze. Umbrella-drinks on demand. And it’s beautiful. 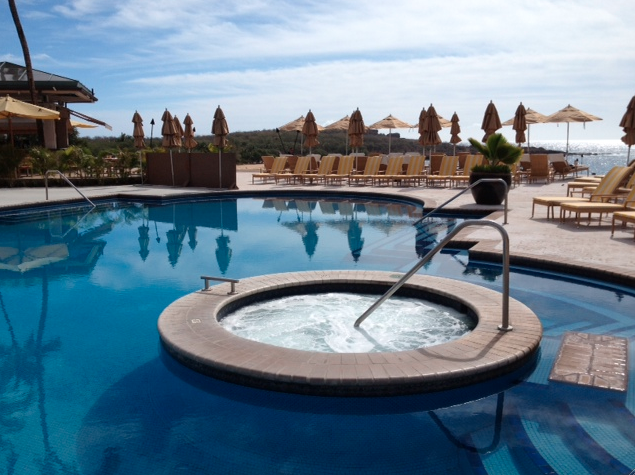 The pool is right there by the water, elegantly shaped with two round hot tubs on either side. 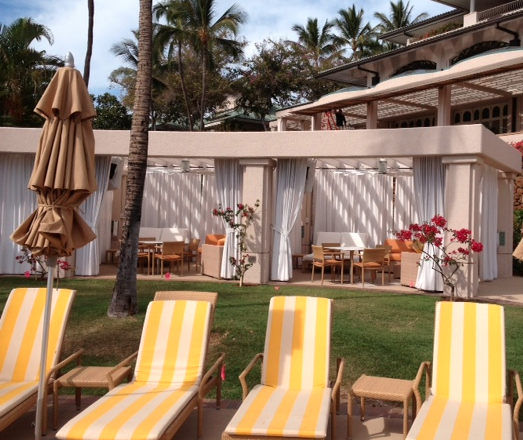 And the cabanas are behind the grass—nice and homey. It turns out the The Lodge at Koele is actually more traditional, if we’re talkin, old-school-Hawaiian country, lush gardens, and a down-home Ohana feeling, in a tucked away mountain retreat kind of way. Often on travelers “10 best” lists, and very popular with return-visitors, Koele is really like no other property we’ve visited. 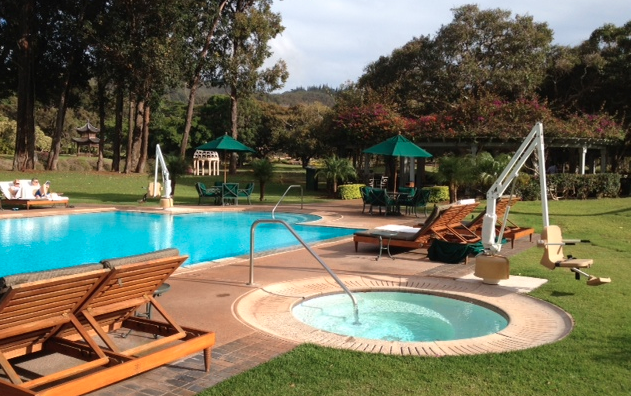 The pool is pretty standard but the location, in the hills on this already-small-town island is other worldly. It’s like going back in time into Hawaii’s history. There are less than 4000 residents on the entire island. There’s one school and no traffic lights. Staying at Koele feels less like staying at a hotel than it does like staying in someone’s amazingly private beautiful ranch. There’s a golf course here too and also hikes, horse-back riding, mountain biking and the like. But it’s way nicer than a backyard pool, and even more comfortable. And of course, it comes with drink and towel service and all the expected amenities. Both properties are awesome, and if you stay in one, you can use the facilities at the other so you really can’t go wrong. Or, you can always break up the trip and stay a few nights at each. 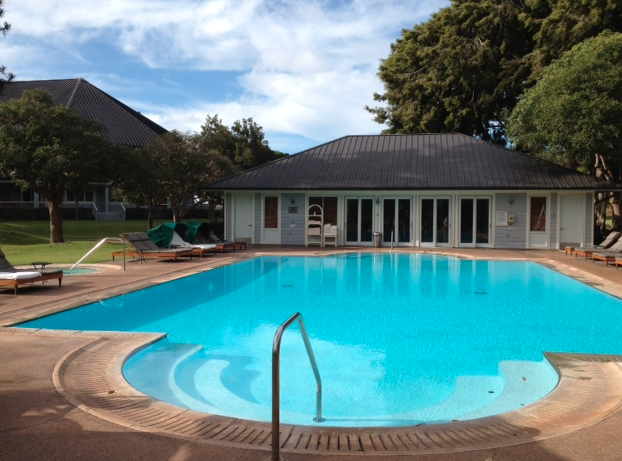 Click here for more Hawaii hotel pool reviews. 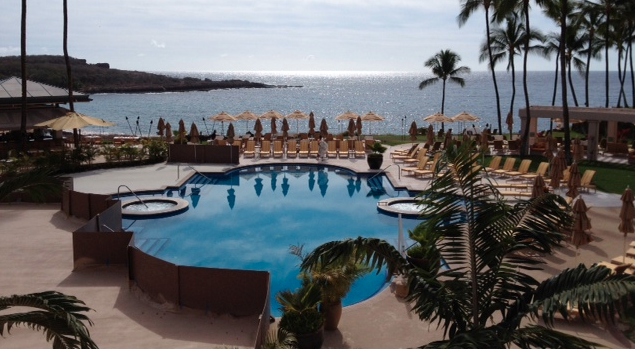 One Response to "THE POOLS AT THE FOUR SEASONS RESORTS, LANAI—MANELE BAY AND KOELE"
I stayed at both properties and LOVED them. One thing not mentioned: You can try sporting clay shooting at the Lodge. So cool! Plus there is a lot going on right now on the island, including a new Nobu restaurant at Manele.